The London Sydney Marathon was the result of a lunch in late 1967 between Sir Max Aitken, proprietor of the Daily Express and two of his editorial executives, Jocelyn Stevens and Tommy Sopwith jr. It was a period of despondency in Britain caused by the devaluation of the pound, and the diners decided to create an event which their newspaper could sponsor, and which would serve to raise the country’s spirits. Such an event would, it was felt, act as a showcase for British engineering and would boost export sales in the countries through which it passed. 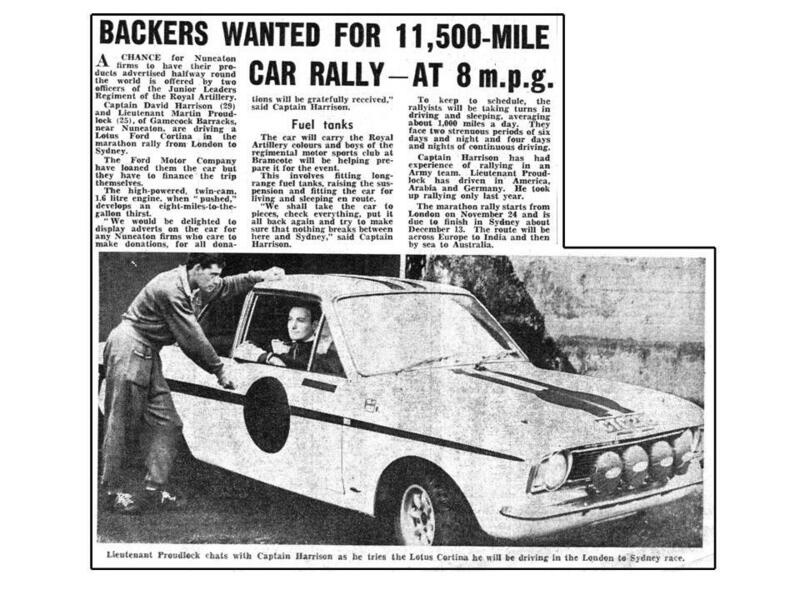 The event attracted considerable interest, and no less than 12 of the 98 entrants were Mk 2 Lotus Cortinas, with six of those supported by the Ford works team and driven by some of the biggest names in rallying at the time. Four of the cars were built at Boreham, one at Ford Ireland and one by a couple of British Army officers, Capt. David Harrison and Lt. Martin Proudlock. David and Martin had a fair bit of help from Ford, such as being ‘loaned’ the ex-Roger Clark car for the event, free access to the Boreham parts store and know-how, and the car had to look the same as the Ford works cars….a Ford works entry by any other name! 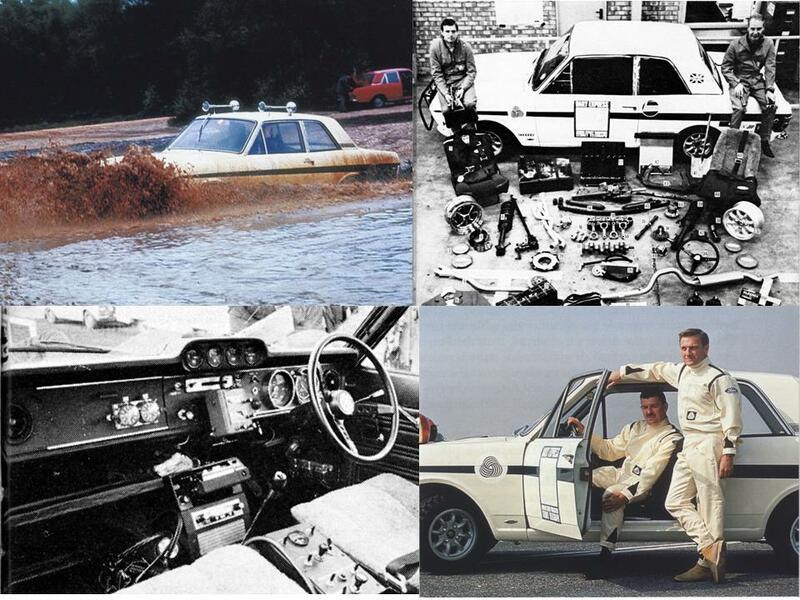 And not just another Lotus Cortina, but one of the famous CTC series of cars, which were used as press, race and rally cars for nearly 2 years. I am greatly indebted to David and Martin for giving me access to their vast archive of information and photographs of the event. They also wrote a 17 page report on the marathon shortly after completion for an internal Army magazine, and I will be using that report to describe events. 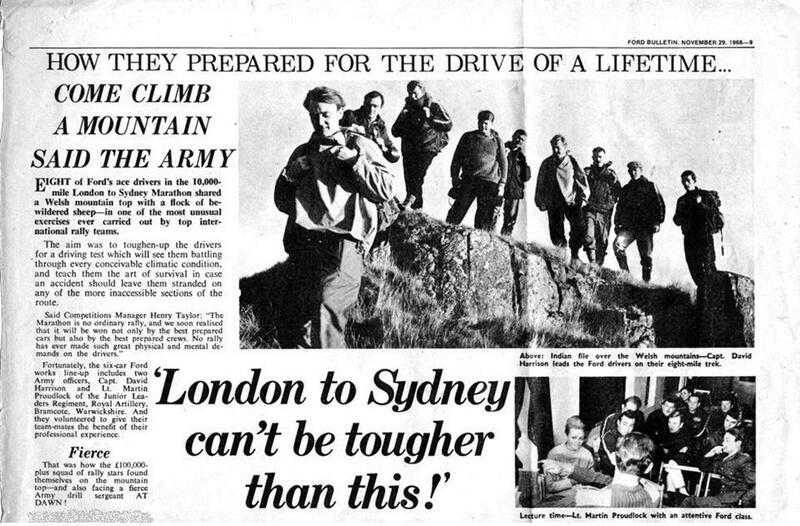 Most of the information here is from David and Martin, but I’ve added in scanned images from magazine articles of the time, together with some from Nick Brittan’s amazing book ‘Marathon – Around The World in a Cloud of Dust’. 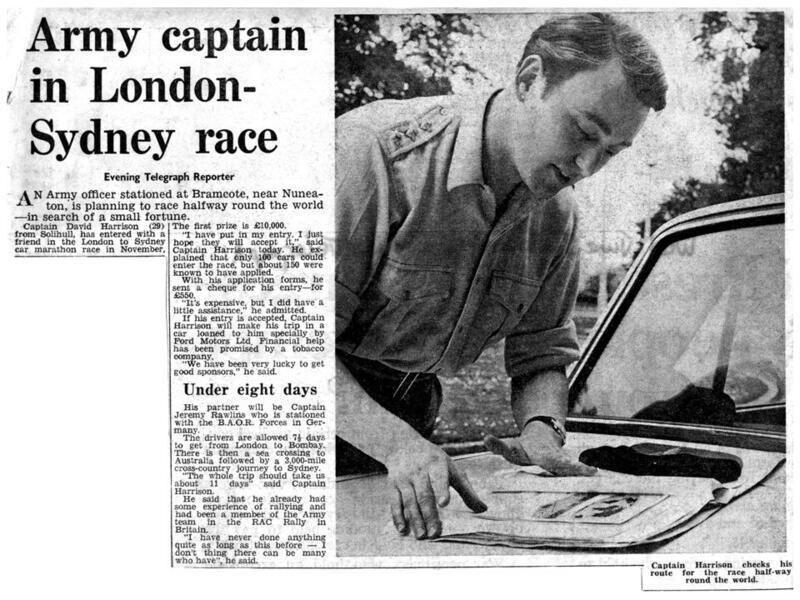 Nick drove one of the other works Lotus Cortinas with his wife Jenny who, being from Sydney and living in London, thought that the marathon would be a more interesting way to get home for Christmas! The book is a must-read, and although it’s been out of print for many years, is still easily available 2nd hand. 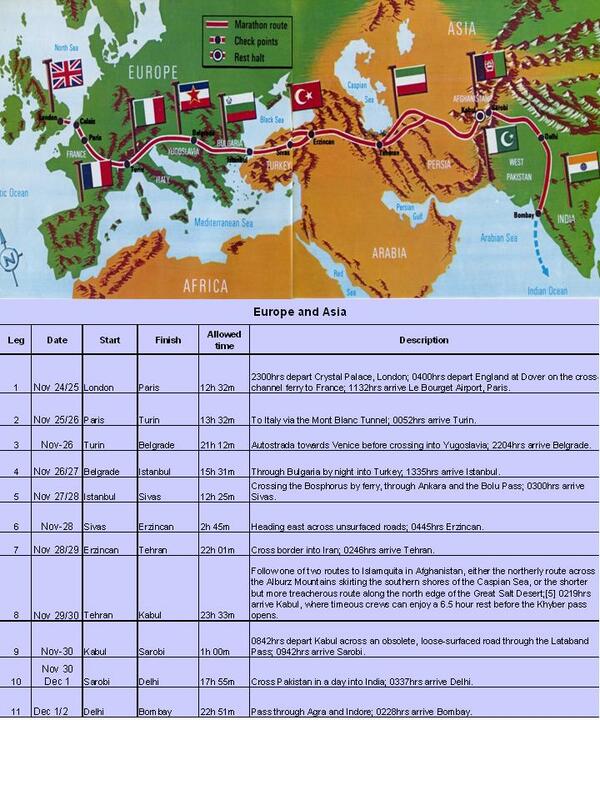 The route was devised to make the marathon as testing as possible, whilst having to take into account the politics of the time. The cars couldn’t go through Singapore as Burma refused entry permits, and the number of ships able to carry 100 cars in Asian waters was limited due to the Arab Israel war having closed the Suez canal. Bombay was selected as the jumping off point, with Jack Sears and Tony Ambrose selected to drive the reconnaissance from London to Bombey, and then Perth to Sydney. What a job! 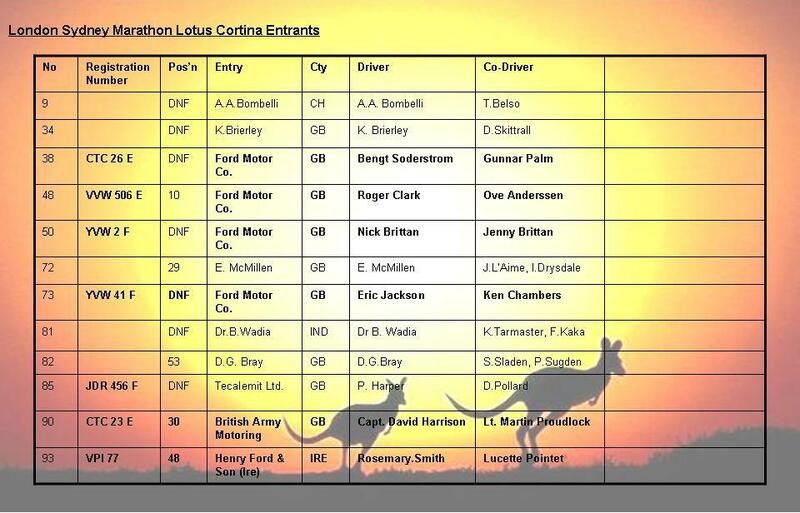 These are the 12 Lotus Cortinas that entered the Marathon, with as much information as I can find currently. Back at Bagshot, a lot of testing was being completed to ensure that the cars could cope with the roughest of terrain. 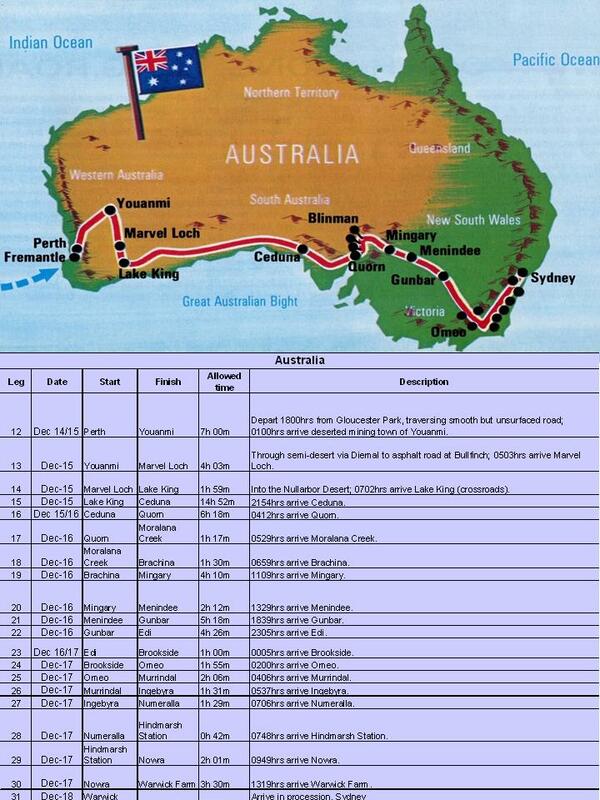 A Rally from London to Sydney – how do you cross the ocean? Oh by boat, that’s all right;” It started as another bright idea from a Bramcote (Army base) bar stool. This idea was different though, it came to something! 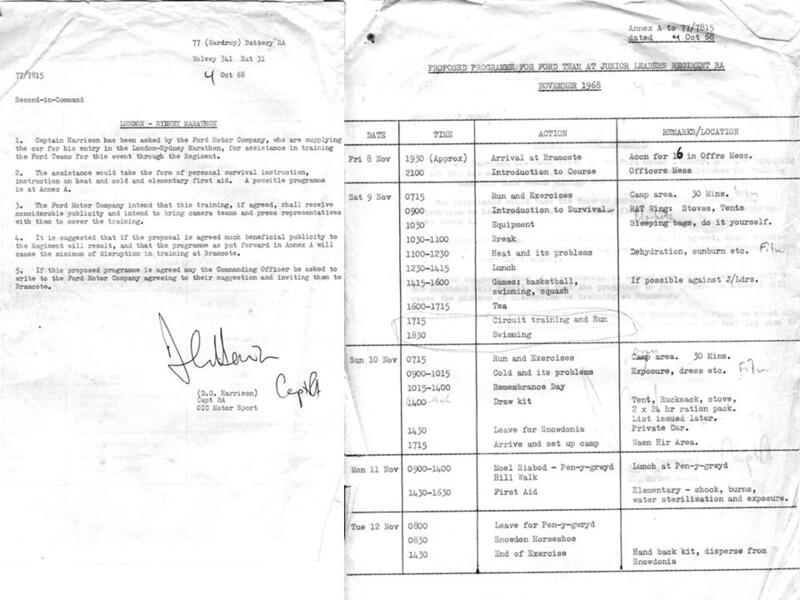 December 1967 saw the first of over 250 letters in the post. Soon a sizeable file grew up on roads – or the lack of them, climate and conditions; all this before the regulations were published. With the arrival of the regulations the rally became serious, as any entry had to be accompanied by the £550 entry fee. I had by now contacted Captain Jeremy Rawlins in 4 RTR who had been promised a car by the Ford Motor Company, and who thought he had a sponsor. The entry was submitted – we found the £550 between us – and to our delight we were among the 100 entries selected. Now we were committed. After 30th June the entry fee could not be refunded. The serious business began of pinning down our sponsors and organising ourselves and our servicing along the route. We struck problems from the start; our potential sponsor backed out. Jeremy Rawlins received a sudden posting and had to back out of the venture; it looked as if it might all be an expensive fiasco. However, not everything went wrong. 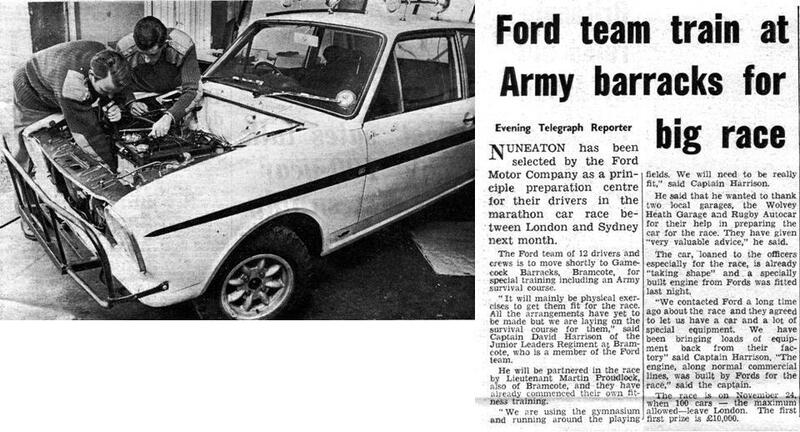 The Ford Competition Department were still happy to loan us a car and all the equipment, so long as we prepared the car and did not ask them to do it; Lieutenant Martin Proudlock offered to come with me in place of Jeremy Rawlins, and so all we needed now was money. Colonel Heaton-Ellis agreed to let us go, on the understanding that we both continued doing our normal jobs until the last possible minute, and that we worked on the car in our spare time. We must have had a lot more spare time than he thought! 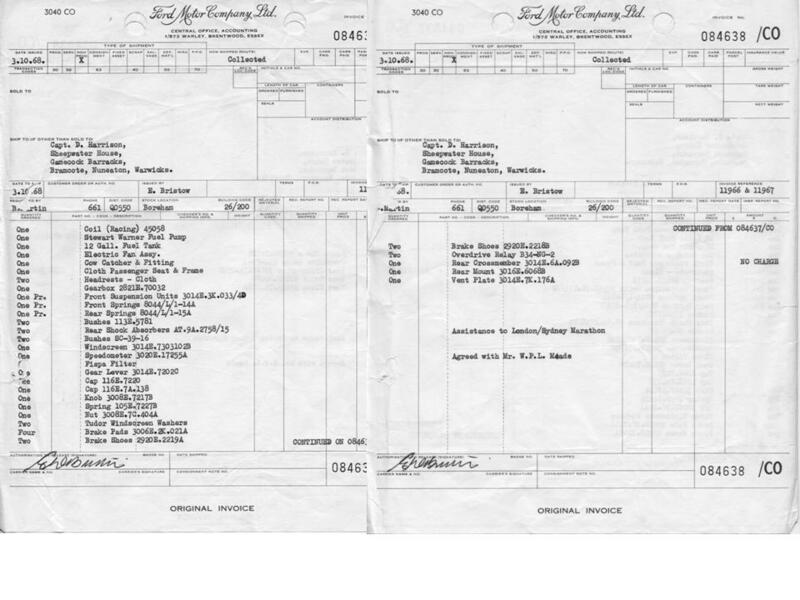 In August we collected the car, a Ford Lotus Cortina, and our first load of parts. 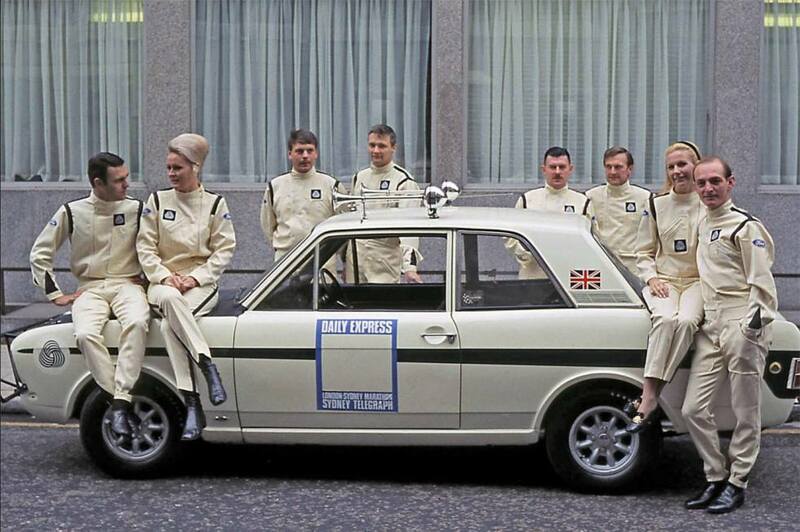 The car had been prepared for the 1967 RAC Rally of Great Britain, but not used because the Rally was cancelled. 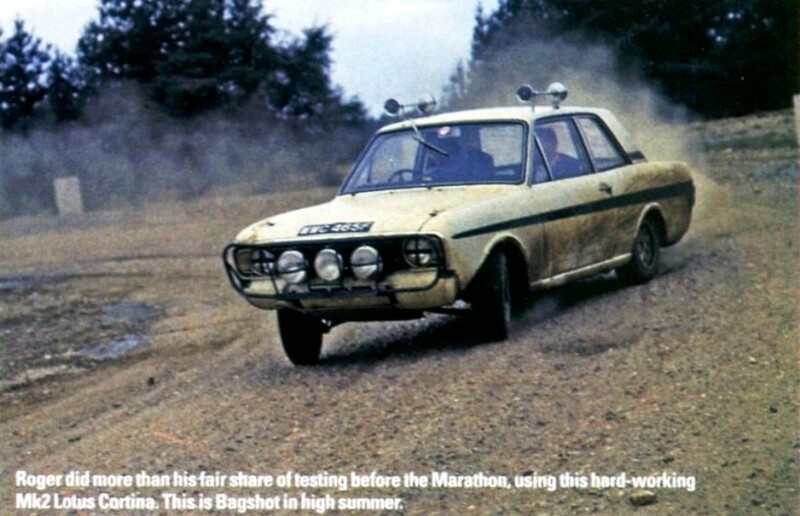 The car had been lent to the press as a typical rally car, and bore signs of a hard 9,000 miles. Preparation of the car was a slow painstaking but rewarding job. The car was taken apart until it was just a body shell. 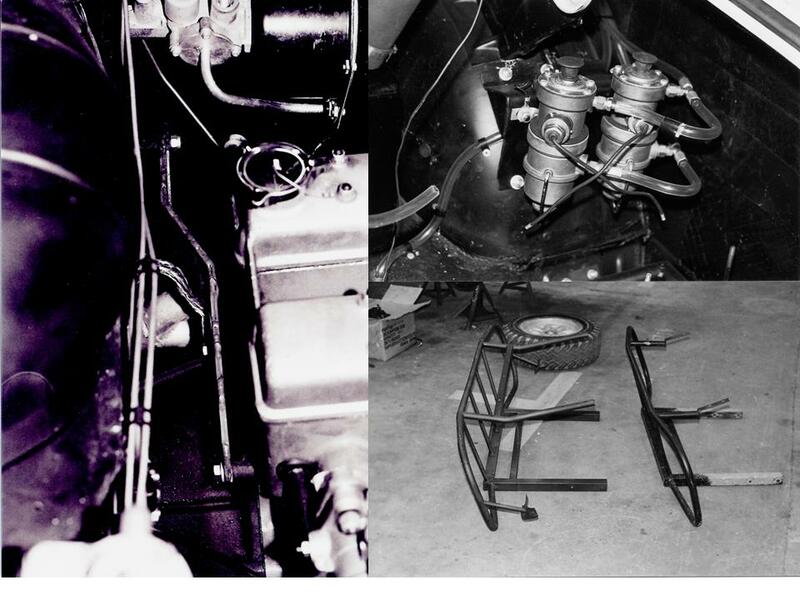 The body shell was stiffened and strengthened by welding the under pan seams, by putting in stiffening plates around the rear shock absorber mountings and by welding in skid plates under the floor. With the basic preparation completed we were able to start rebuilding. The suspension was replaced with “East African” Cortina suspension; the engine, gearbox and final drive were replaced with new parts and at last the fitting out of the car began. Holes were bored everywhere taking wires, light fittings, horns on the roof, brake and fuel lines inside the car; our check list seemed never ending. By the middle of October the car was taking shape, the kangaroo guard was fitted, the car went under its own power, but there was still a lot to do. The sump shield brackets had to be made and fitted, the 19 gallon auxiliary fuel tank fitted, all the auxiliary horns and lamps wired in and everything had to be put in with a view to it taking a terrific pounding. Where a rivet would do a bolt was used, where a bolt would do, fit two bolts or weld it; all the time bearing in mind that the car had to be as light as possible. We had two mottoes as we worked on the car, the first was “Belts and braces”, and the second “Add lightness, go faster”. Everything was fitted with these sayings in mind. Eventually, on the 7th November the car was ready. We took it down to the Ford Competition Department at Boreham in Essex where the alternator was fitted, the works mechanics checked the car over and said “she’ll do”. 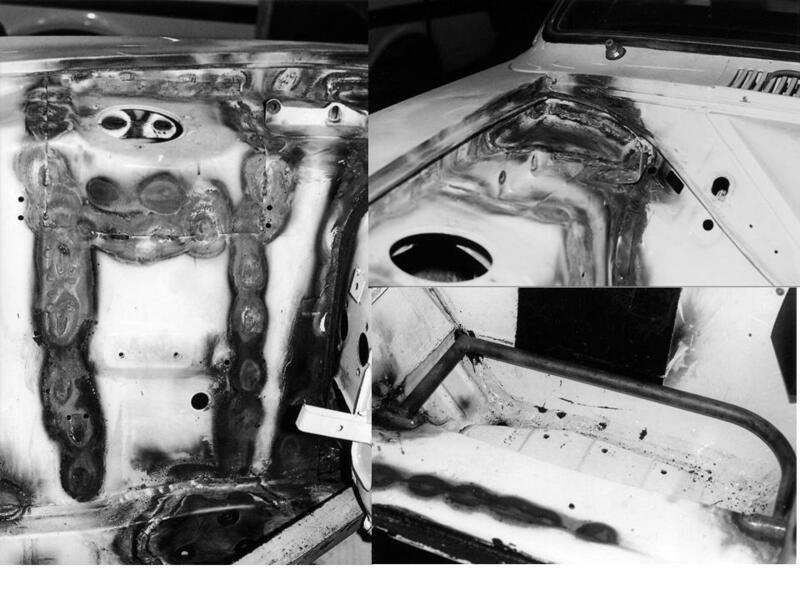 At Boreham, photographs of the works car preparation were taken so that David and Martin could prepare their car in the same manner. Considerable strengthening was required around the strut towers and the inner wing to bulkhead areas, with the batter area given it’s own crash-bar protection. 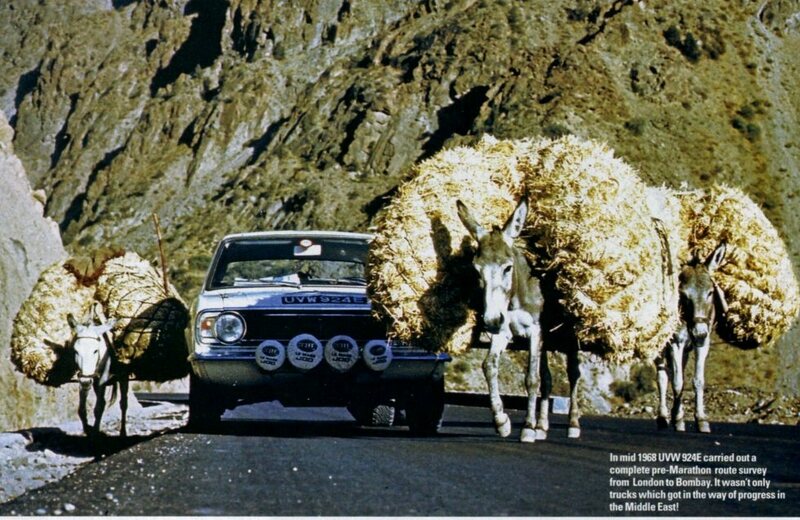 The passengers weren’t looked after quite as well, with no roll cage or even roll bar fitted! An anti-rock bar was added to stabilise the engine, and the same design Kangeroo Bar added. Twin fuel pumps were installed in the boot. 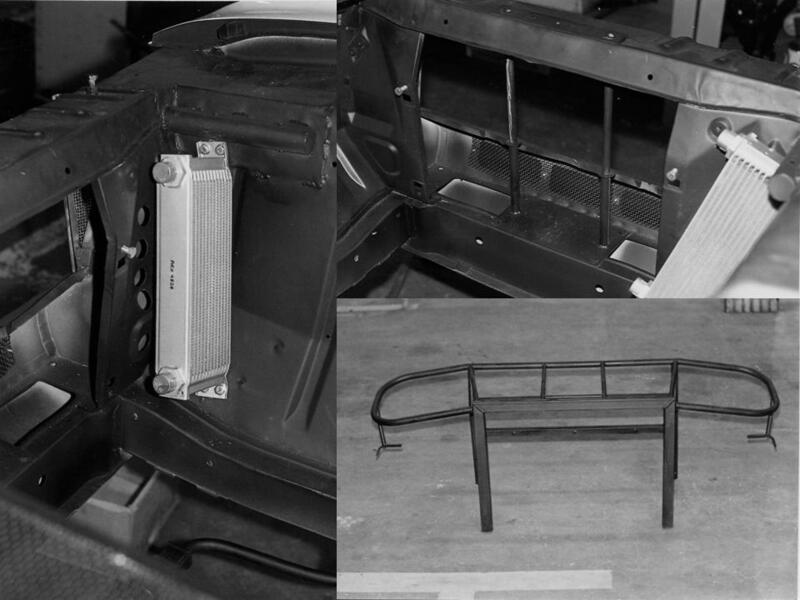 An oil cooler was added, and the pictures show the considerable strengthening required at the front of the car, together with the re-enforcement required for the kangeroo bar. The magic words….’No Charge’ ! 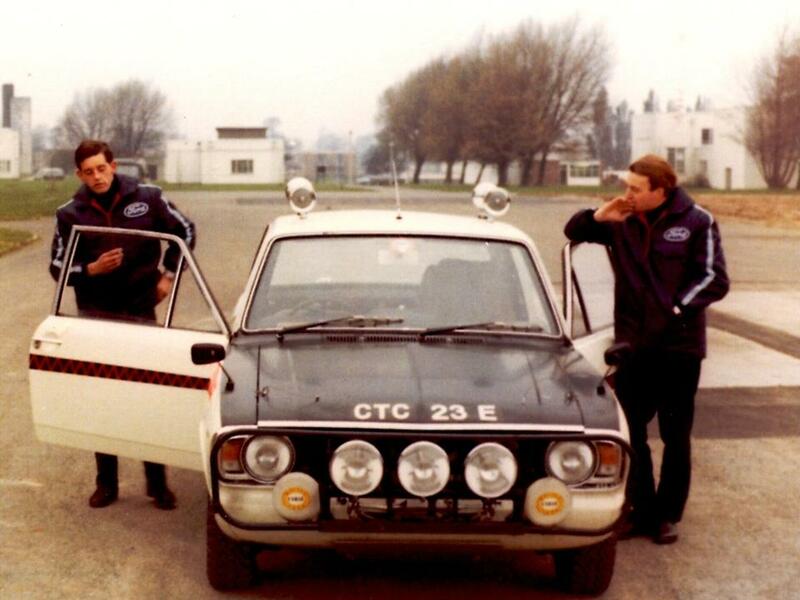 One of the Ford cars being tested at Bagshot. This car had an additional wiper motor at the top of the windscreen, which makes it either Rosemary Smith’s or Nick Brittan’s car. Neither car used the additional wiper on the Marathon. 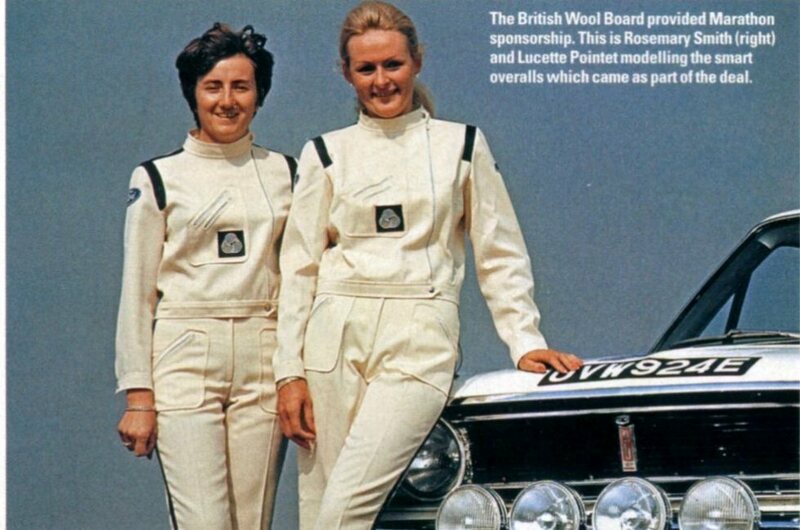 The Wool Board was a major sponsor of the Ford Team, and provided sheepskin seat covers and overalls for the drivers and co-drivers. 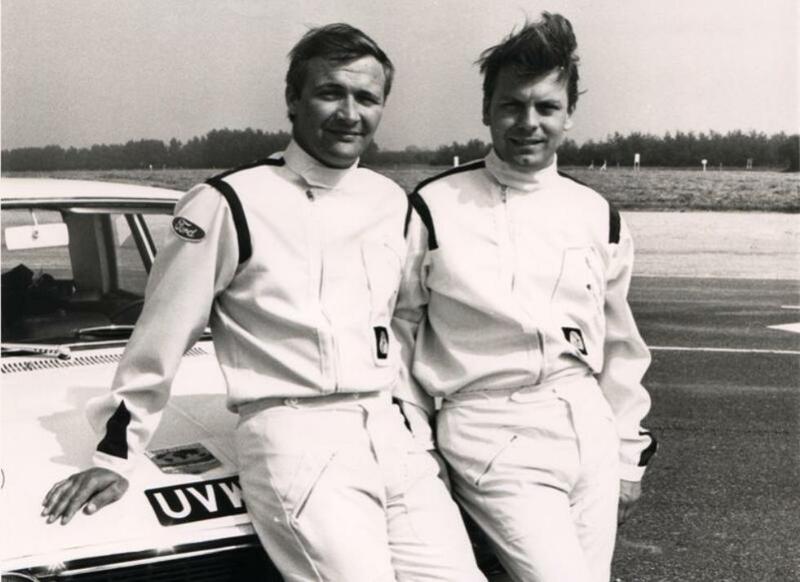 Eric Jackson and Ken Chambers (above) are seen here showing off their kit, next to the Wool Mark sticker on the car. 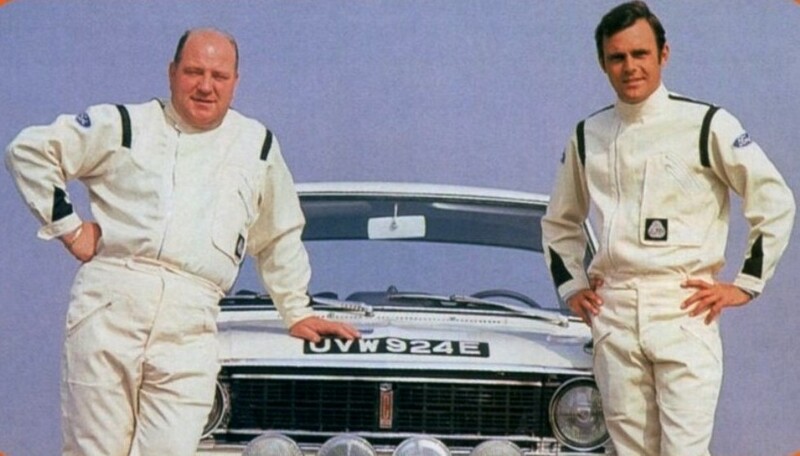 The rest of the main Ford Team drivers had to show of their smart white wool suits as well! Rosemary Smith tries out the home comforts of the car she’s going to spend a few weeks driving around the world! 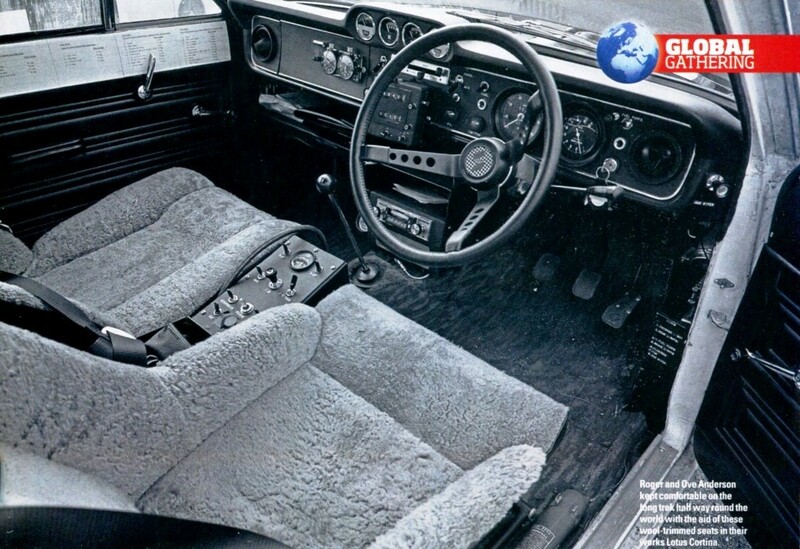 The Wool Board sponsorship extended to the seat and floor covers. I wonder what they looked like after driving the bull-dust roads of Australia?! The cars were not the only thing to be prepared. 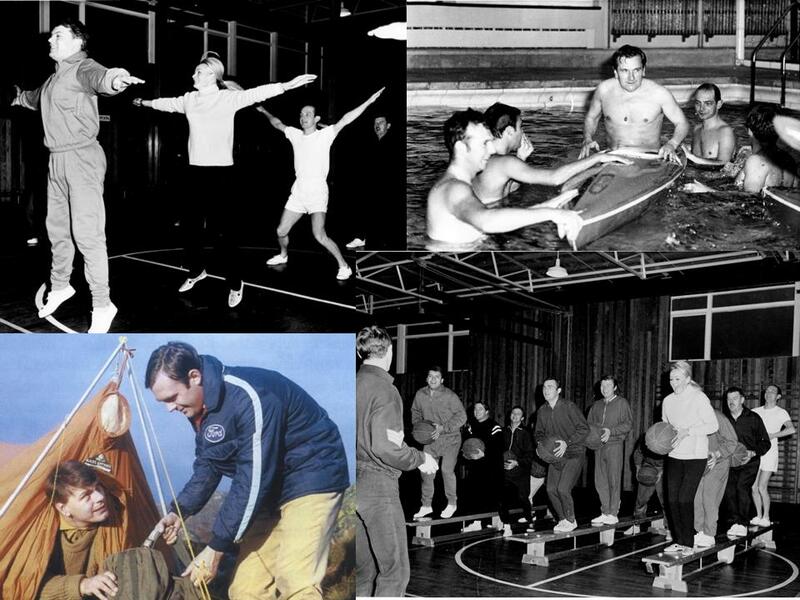 Ford asked David if he would organise a fitness and survival training long weekend for the Ford team, something the Army was very well equipped to do. At last; After three months work, 3,000 and more miles in our own cars; towing the Lotus to be worked on by local garages – notably Wolvey Heath Service Station and Rugby Autocar in Coventry; trips to Boreham to collect a mountain of parts ranging from spring clips to an engine; and not least consuming a vast quantity of beer, the car was ready. We were given a Regimental send off from Bramcote, and at Woolwich the car was “christened” by General Glover on the Parade Ground in front of the Officers’ Mess.